When it comes to movies I almost don't have any preference to which method of madness to embark on for my escape from reality. I watch loads of movies in theaters every year, I have thousands of DVDs and I even have a few Blu-rays despite not having a Blu-ray player. Regardless of all the way I access my movies, I still do not rent films. The last time I rented a movie was almost a year ago and I'm almost certain I was under the influence of someone else, most likely an elderly relative. I just don't see a need to rent a movie I like when I can own it or most likely watch it online for free. Web sites everywhere are offering movies on demand for free, from Hulu to YouTube, and I'm capitalizing on their generosity. And even if it wasn't free, online movies still have an edge over rentals simply due to the matter of convenience. Why drive or even walk all the way to a video store or rental box when I can just sit at home on my bed with a trusty laptop and a decent wireless connection? Maybe I'm biased. Okay, I know I'm biased. 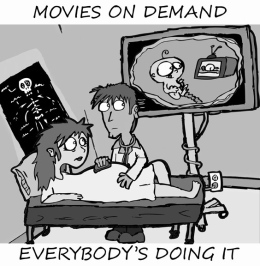 Almost everything I do from work to leisure is done via computers, but that just makes online movies all the more logical. Besides, if I ever miss the feeling of sitting down to watch a movie on my television I can always plug my laptop into the TV and watch it from there. Online movies for the win.